Armoured heat! The XRS-12 gloves are comfortable heated gloves with protective knuckle and finger armour. Made from soft, supple drum-dyed full aniline leather, they fit exceptionally. Heat is provided along the entire length of each finger, including the thumb, as well as the back of the hand. The heating elements power up within seconds of plugging the gloves in. The design is stylish and very functional as a light, but strong, pliable glove. And due to the use of Stainless Steel heating wire, these heated gloves are the most durable gloves in the world! Quality you can trust: These Gerbing heated gloves come with a lifetime warranty on the heating element. Gerbing have proven themselves last season and shown that they listen to consumers. Their best selling model is the XR-12 gloves, which has also been awarded RiDE Recommended. Users of these gloves commented that they would like a pair of heated gloves that fit under their jacket sleeves. That's where the XRS-12 comes in! Please note: Due to the thicker lining of these winter gloves, you may need to purchase a size up than you usually would in summer gloves. If you're unsure, come into store or we'll be happy to do a free exchange if your gloves are the wrong size. "Just what the doctor ordered on a bitterly cold winters morning!...great quality, great fit, great fEEling!! …. highly recommended"
"I tell everyone about how good these gloves are, i have had them now for over 12 months and they really are a gift from the Gods. Heated Grips may keep your palms warm but these boys keep your hands and fingers warm. Without a doubt the best thing i have bought for a motorbike." "Have not got a bad word to say about these gloves. Right from the first use they were comfortable, no breaking in, warm even without the heater, really well-made. Then it got really cold. Used the 3rd setting at minus 5 Celsius and arrived at work with toasty warm hands... I have worn them every work day for the last 5 months and they still look like new. Just bite the bullet, they are worth EVERY penny." "I have Raynaud's (limited blood circulation in my fingers, excruciating in cold temperatures) and have always struggled to find a winter glove that keeps me warm through these cold months. I have found pairs that have come close but thought i would give in and try these heated gloves...WOW! i wish i had tried them years earlier. I bought mine last year and havnt looked back. Not once have i even thought about my hands while riding and iv not had them past the medium setting. I found the long cuff ones a little faffy with my jacket but these are perfect. :)"
"Really couldn’t recommend these heated gloves enough. I was concerned that the wires that pass through the sleeves would annoy me but they don’t. These gloves keep my hands warm enough without ‘toasting’ them. I like the 2 existing heat settings with the option of releasing the 3rd/4th for those Arctic ridesThe only thing I need to remember is to unplug myself before getting off the bike!" "These gloves are really a god send. Used heated grips for more than 3 yrs. TBH they were not helping me with the cold. I drive to London (about 1 hr) daily and heated grips were not great. After Changing my bike I thought to give these gloves a try(no heated grips) and believe me numb fingers are a thing in the past. If you are a daily commuter - just get one of these. Btw I had to go for one size bigger." 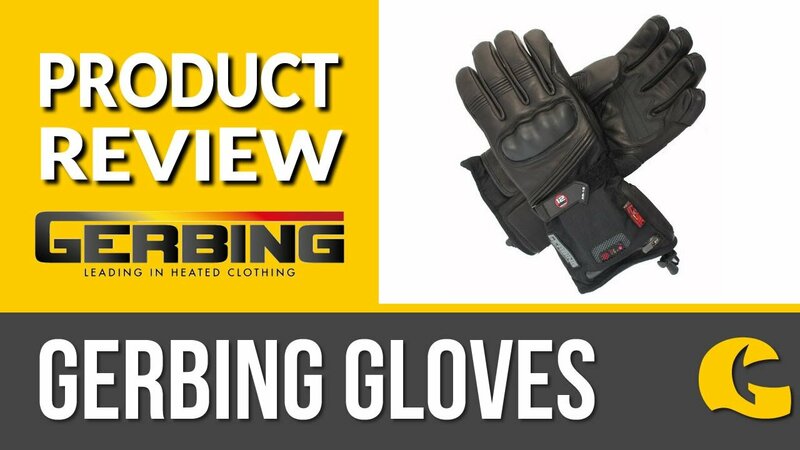 "These Gerbing gloves are very well made indeed. A clever use of different materials has produced a glove which is functional, hard wearing and comfortable. The variable heat settings should keep your hands warm from +5 to -15 degrees. The controller is easy to use and stays on your last setting. If you ride any distance through cold weather I am afraid you are going to want a pair of these, they make all the difference to your comfort and more importantly control of your bike."